There are 20 Assisted Living Facilities in the Niles area, with 3 in Niles and 17 nearby. The average cost of assisted living in Niles is $2,985 per month. This is lower than the national median of $3,346. Cheaper nearby regions include Youngstown with an average starting cost of $2,400. To help you with your search, browse the 65 reviews below for assisted living facilities in Niles. On average, consumers rate assisted living in Niles 4.5 out of 5 stars. Better rated regions include Boardman with an average rating of 5.0 out of 5 stars. Caring.com has helped thousands of families find high-quality senior care. To speak with one of our Family Advisors about assisted living options and costs in Niles, call (855) 863-8283. With historical museums, live theatre, and one of the largest retail centers in the nation, Niles, Ohio has plenty to do for the area’s seniors, who account fo 18 percent of the city’s population. Seniors in need of facility care have 20 assisted living facilities to choose from, including three directly in Niles and the other 17 located in nearby locations. In Niles, like the entire state of Ohio, assisted living facilities are referred to as Residential Care Facilities (RCFs) and are licensed and overseen by the Ohio Department of Health. In Ohio, and in Niles, seniors are not taxed on Social Security benefits; however, income from pensions is partially taxed and retirement savings account income is fully taxed. Niles has a violent crime rate of 16.7, lower than the national average of 22.7 and the city’s property crime rate is 56.2, higher than the national average of 35.4. The city's low violent crime rate might give families peace of mind in knowing that Niles is a relatively safe city to live in. The cost of living in Niles is 73.8, considerably lower than the national average of 100. Seniors can also expect to pay less for transportation, healthcare and groceries. This might be good news for seniors with tight budgets. The air quality in Niles is poor. On a scale where 100 represents the areas with the best air quality, Niles ranks 52, five points lower than the national average of 58, which might be of concern to seniors with breathing difficulties. Niles has cold, rugged winters with temperatures dropping as low as 18 degrees in January and gets 48 inches of snow annually, compared to the national average of 26 inches. Seniors who don’t like the snow may not appreciate living in Niles. Niles has no facilities from which to choose in the event of a medical emergency or illness, with the nearest major hospital located in Warren. Assisted Living costs in Niles start around $2,985 per month on average, while the nationwide average cost of assisted living is $4,000 per month, according to the latest figures from Genworth’s Cost of Care Survey. It’s important to note that assisted living rates in Niles and the surrounding suburbs can vary widely based on factors such as location, the level of care needed, apartment size and the types of amenities offered at each community. 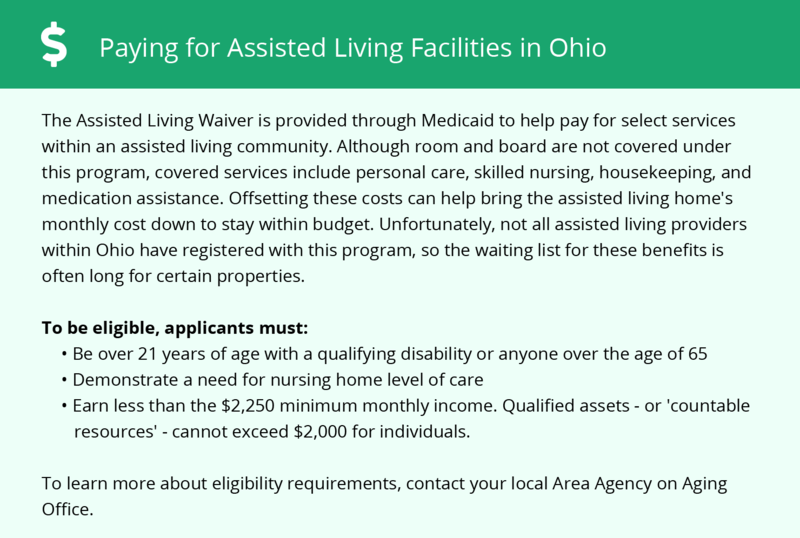 Seniors in Niles can access Ohio’s Assisted Living Waiver Program to help pay for their care. Although this program pays for care, it does not pay for room and board. 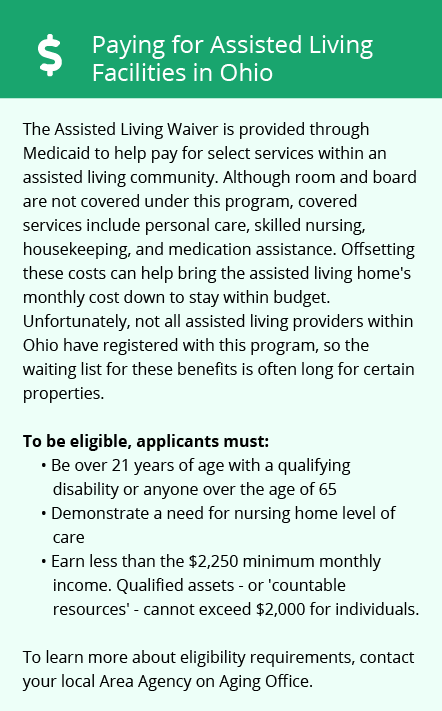 All applicants must be at least 59 and Medicaid eligible. This is not an entitlement program, meaning qualified applicants may be placed on a waiting list due to the limited number of spots available. Niles and the surrounding area are home to numerous government agencies and non-profit organizations offering help for seniors searching for or currently residing in an assisted living community. These organizations can also provide assistance in a number of other eldercare services such as geriatric care management, elder law advice, estate planning, finding home care and health and wellness programs. To see a list of free assisted living resources in Niles, please visit our Assisted Living in Ohio page. Niles-area assisted living communities must adhere to the comprehensive set of state laws and regulations that all assisted living communities in Ohio are required to follow. Visit our Assisted Living in Ohio page for more information about these laws.